"I dream't I dwelt in marble halls"
Devoted to the histories and current state of the great mansions of America's Gilded Age. 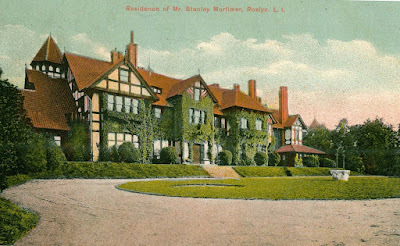 On June 9, 2015 at 2pm, Architect & Author Gary Lawrance will be giving an illustrated presentation about some of the great mansions that once lined the North Shore of Long Island, that were said to have been the locations used by F. Scott Fitzgerald, while writing his great American novel, "The Great Gatsby". 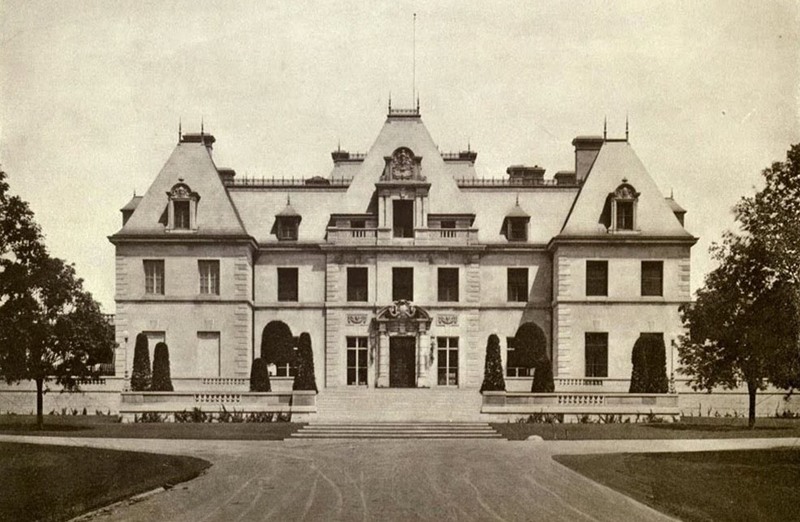 The North Shore of New York's Long Island, due to the numerous concentration of estates and mansions built during the Gilded Age became known as the "Gold Coast". It was here that F. Scott Fitzgerald wrote and partied with the very rich, famous and celebrated people of the 1920's Jazz Age. 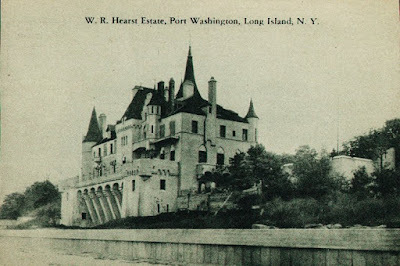 The Gold Coast started at Great Neck, where Fitzgerald lived and ran along the Long Island Sound to Centerport. When Fitzgerald wrote, "The Great Gatsby", he didn't use just one house or location but combined many. Sometimes he moved them all around so that those that were almost next to each other ended up being moved across the water. 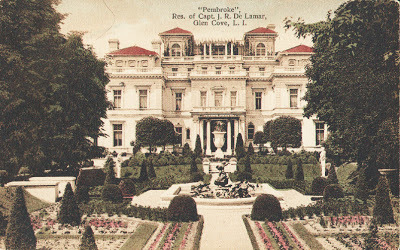 Pembroke, The De Lamar mansion at Glen Cove, New York. 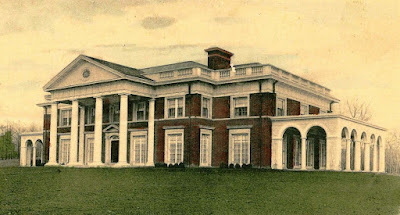 Pembroke, the Captain De Lamar Mansion at Glen Cove. Where many parties during the roaring twenties attended by some of the silent screen's greatest stars took place when the house was later owned by Marcus Loew, the movie theater magnate. 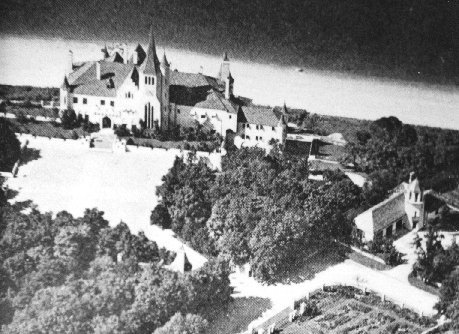 Beacon Towers, The Belmont mansion at Sands Point, New York. 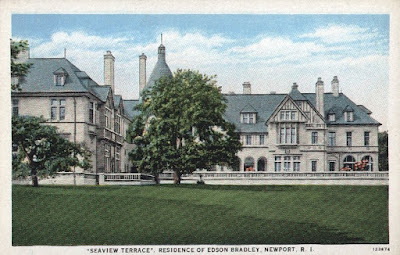 Beacon Towers, Sands Point, The castellated mansion of Alva Vanderbilt Belmont which bears a very close resemblance to Gatsby's Mansion as described by Fitzgerald. Lands End in the background, The Swope mansion at Sands Point, NY. which architecturally could have been the home of Daisy & Tom Buchanan. A brief aerial tour of Long Island's Gold Coast circa 1926 will look at some of the other mansions of the era. 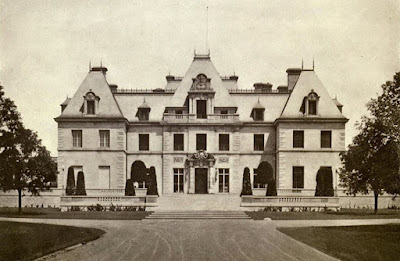 Not to be left out are Clarence Mackay"s, Roslyn mansion "Harbor Hill", where the Prince of Wales was entertained at a party befitting the Great Gatsby and "Oheka", the former estate of banker, Otto H. Kahn, which was the largest private residence on Long Island. Oheka which to many loyal fans of the TV Series, "Royal Pains" is used as the home of a millionaire, Boris Kuester Von Jurgens-Ratenic. 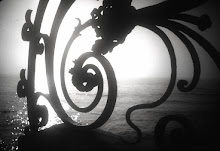 Mr. Lawrance will also show how this majestic mansion deteriorated into a hideous fire ravaged ruin, but through creative preservation ideas, has been returned to it's former splendor as a luxury hotel and catering venue. 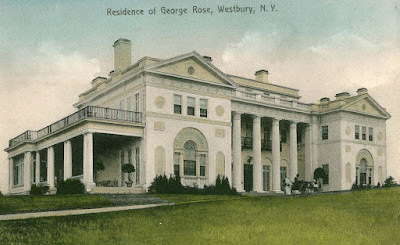 Harbor Hill, The mansion of Clarence Mackay at Roslyn, New York. 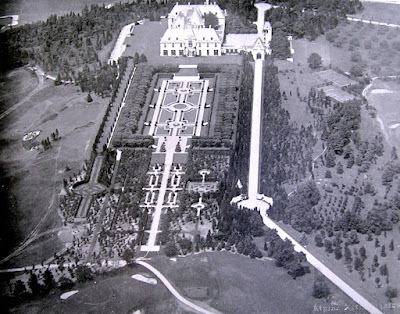 Oheka Castle, The Otto H. Kahn mansion at Cold Spring Harbor, New York. The talk will be held at Mill Neck Manor also known as Sefton Manor, the site of this springs latest Long Island show house. Make a day out of it and attend the show house and plan on attending my talk. Click HERE for information about the show house. Mill Neck Manor is located in Nassau County on the North Shore of Long Island, near Oyster Bay. Gary Lawrance is an Architect and Author from Stony Brook, New York. He is co-author of the book, "Houses of the Hamptons 1880-1930" with Anne Surchin. The book can be bought on Amazon. Thanks for such a nice blog. You really work hard to make this blog attractive and knowledgeable in the searching Long Island Homes . 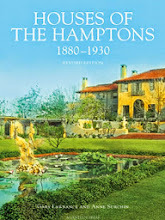 Book: Gary Lawrance Co-author of "Houses of the Hamptons, 1880-1930 Revised Edition", Acanthus Press 2013. Click above to see my favorites.